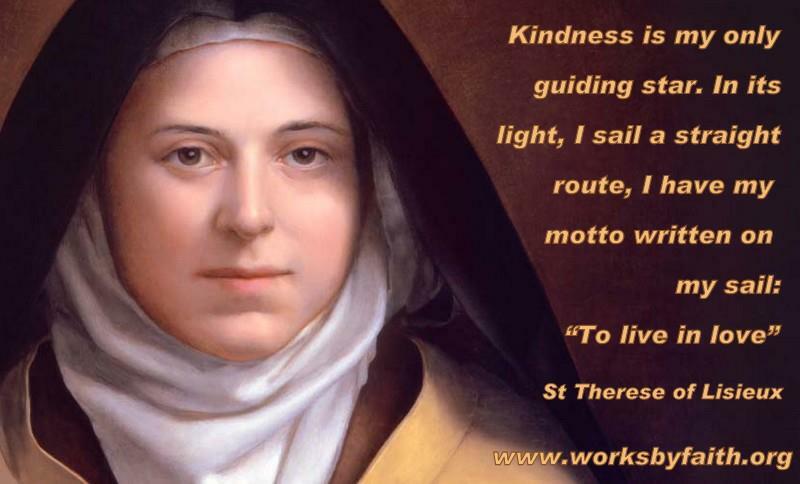 Happy Feast of St Therese! Today is just such a beautiful and special day. It is a day to celebrate an incredible women and soul. One who inspires me continuously to strive to do everything with more love, more joy and more smiles. St. Therese may have lived for 24 years but her example and love will live on forever. Feast days are always such a fun way to bring joy and love into your home. Whom doesn’t love to celebrate – especially children? So today after school we will pull out our fancy fine china tea cups, our beautiful teapot from my sister and a delicious baked good (still need to make this lol). We will gather around talk about St Therese beautiful life, her example and how we can show love more in all that we do. 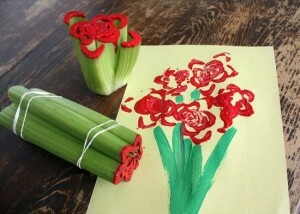 Then after enjoying our goodies we will make some new crafts that I found for us. Who doesn’t love pinterest – at the click of a few buttons you find so much inspiration. I found this adorable simple and fun painting to make – you simply need white paper, green & paint for the roses (red, purple, pink, yellow, and/or blue) paint, celery, scissors, and your imagination. You could even use coloured construction paper and use white paint instead for white roses. We will have a lot of fun making different variations with this idea. It is also a great craft from preschoolers to adulthood. Here are some of the paintings we made at our tea party today after school! I found wonderful website this week that I just have to share its called Shining Light Dolls. 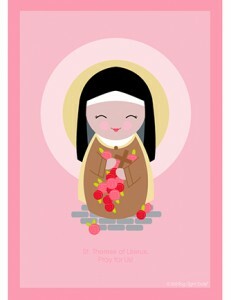 This wonderful website offers lots of free cute and colourful Catholic Saint and Mary printable. These images will come in handy throughout the year – with all saints day coming up, birthdays, feasts. My head is just whirling with ideas to use these cute images with. In past years 0ne craft that the kids and I have enjoyed making on the feast of St Therese is greeting cards which we mail out to grandparents, great grandparents, godparents and some aunts. After finding this lovely image of St Therese I know we will have to send this beautiful image out without greeting cards to family members with a special love of St Therese. We will print the image, print out beautiful quotes by St Therese and then glue them on coloured paper and personalize the cards. If you looking for a cute or special gift for a baptism or birthday Shining Light Dolls have adorable little dolls, charms and prayers cards too! 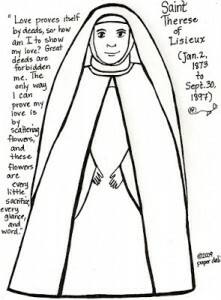 Another craft ideas is this adorable free St Therese paper doll. 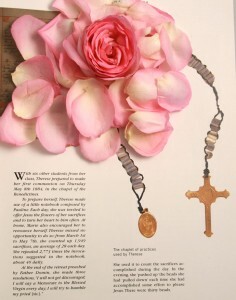 Paper Dali offers this free, cute printable, she even has a page of accessories with roses, a cross and the holy face of Jesus. I would recommend printing this on card stock if possible if not, I would colour the doll, then glue it to construction paper, let it dry and then cut out the doll so that it is stronger and lasts longer for your little girl! A fun and wonderful activity to make for the feast of St. Therese, advent, lent, preparing for 1st Holy Communion, as a baptism gift or a catechism group activity is the St. Therese Good Deed/Sacrifice Beads. 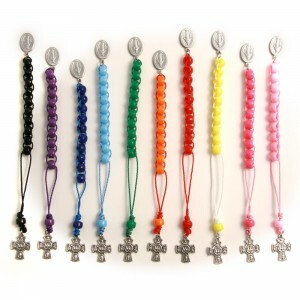 You can find instructions on how to Make the Good Deed/Sacrifice Beads here. What better way to teach the children how to offer up little acts of love throughout the day then by following little St. Therese own example as she did as a child. To the right is a picture of the beads used by St Therese when she was little. She used her beads faithfully each day as she prepared for her holy communion. 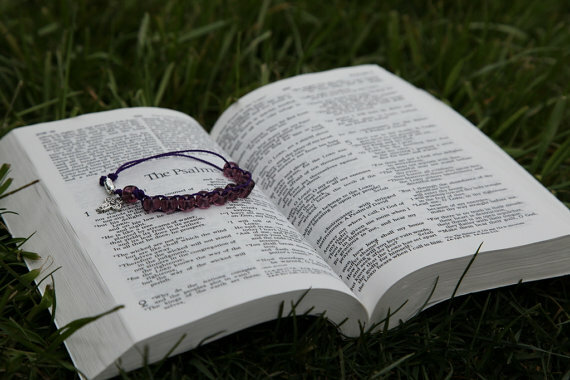 What I love about St. Therese is that she offered Jesus the good too – ie she would eat her dinner and she would tell Jesus that the dessert was for him, she offered up her joy, not only her suffering. I think that this is an important step towards making your entire day and act of prayer and love as she strived to do daily. Here is a link to an older post when we made a beautiful 3D Rose craft to celebrate the feast of St Therese. If you have other craft ideas please share them in the comments below! Whatever you do today, wherever you go, may you spread love and joy!